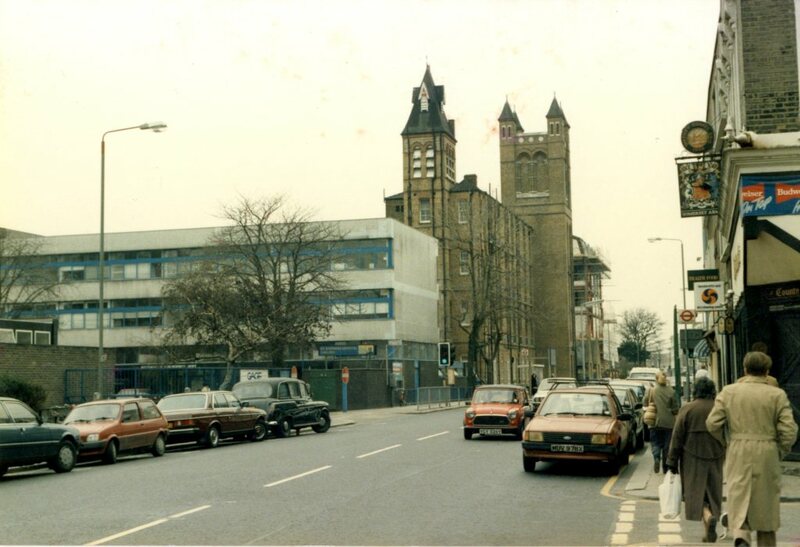 Although this view is about 25 years years old I still remember St Stephen’s Hospital pretty well. I went there several times, including one memorable occasion not long after my wife and I were married. She had managed to stab herself with a screwdriver while opening a tin of paint. Annoyed with the situation, and with me, she only lingered at the hospital long enough to get the small injury stitched. When we got out onto the street she was as pale as a vampire but refused to go back inside. I concentrated on getting her home. There’s another pale woman in a long dark coat. 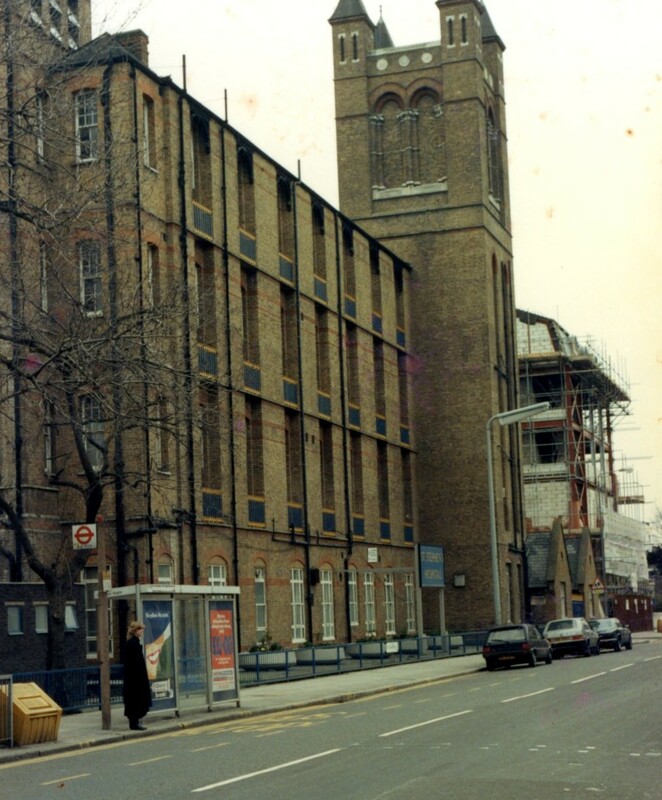 St Stephen’s was a former workhouse / infirmary (more of its history in this post). 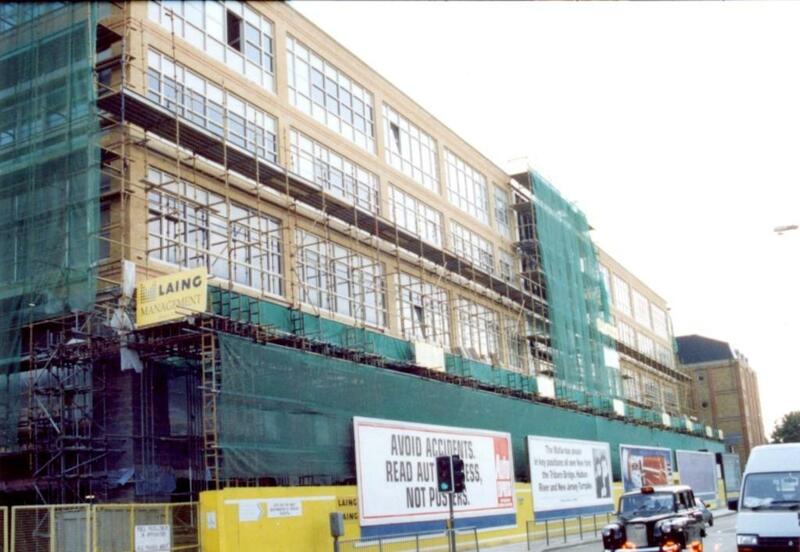 Despite the addition of a new wing it was showing its age and the plan to replace it was on the whole a good idea. 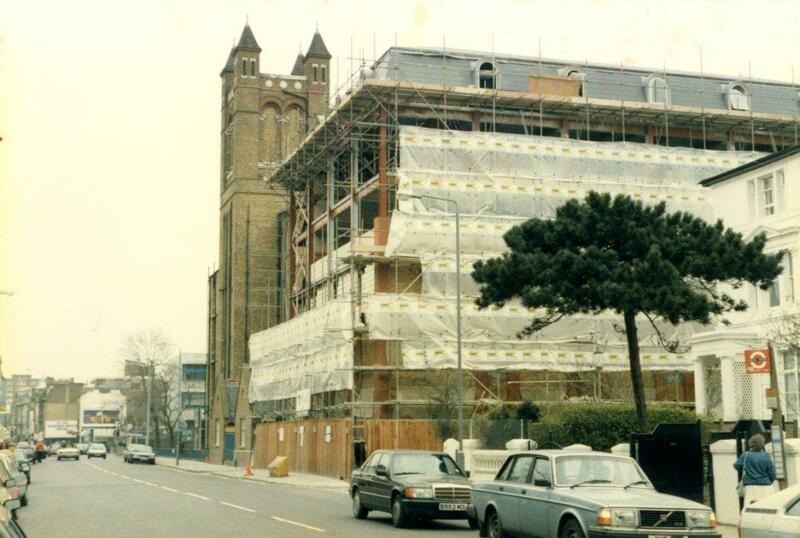 On the right of the picture, you can see another new building, the Kobler Centre / St Stephen’s Clinic under construction, on the corner of Netherton Grove. 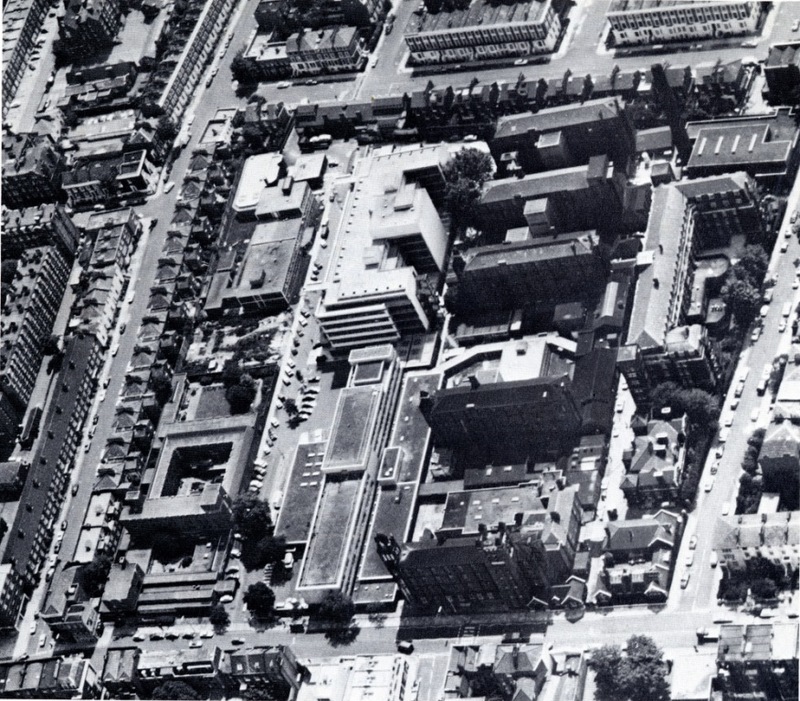 This picture shows the other buildings in Netherton Grove, including the nurses’ home. 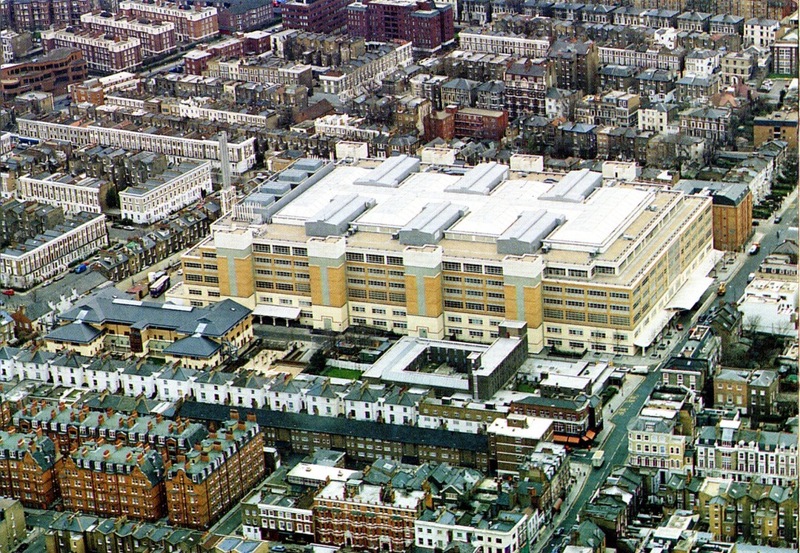 The new hospital the Chelsea Westminster, finished and opened in 1993, which combined units from several hospitals in west London was under some planning constraints. 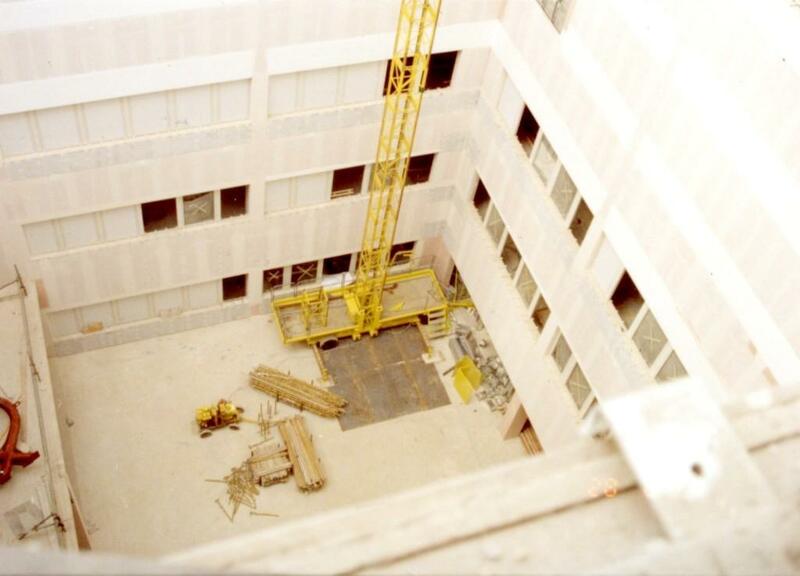 The building could not be too high so the architects opted to use the maximum amount of space on the site to create a large box with an atrium inside it. The Library is lucky enough to have been given given a folder containing a set of photographs taken during the construction of the hospital. Regular readers will know that I love a building site so I make no apology for presenting these construction scenes without much further historical commentary. In fact the Figg photos merely act as an introduction. As I frequently do I scanned far more pictures than I could us in one post. I’ve been trying to cut down the number but haven’t entirely succeeded. If you’re not a fan of building construction stop here. 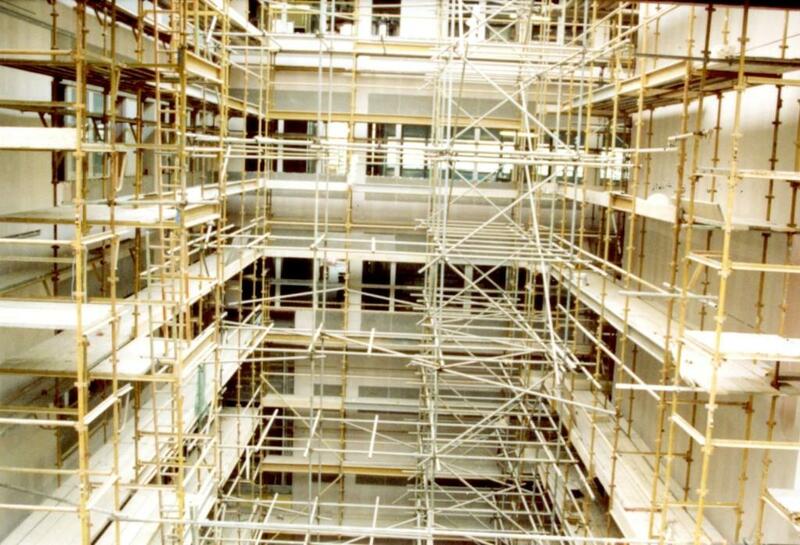 The rest of us can enter a world of scaffolding, concrete, mud and heavy machinery. 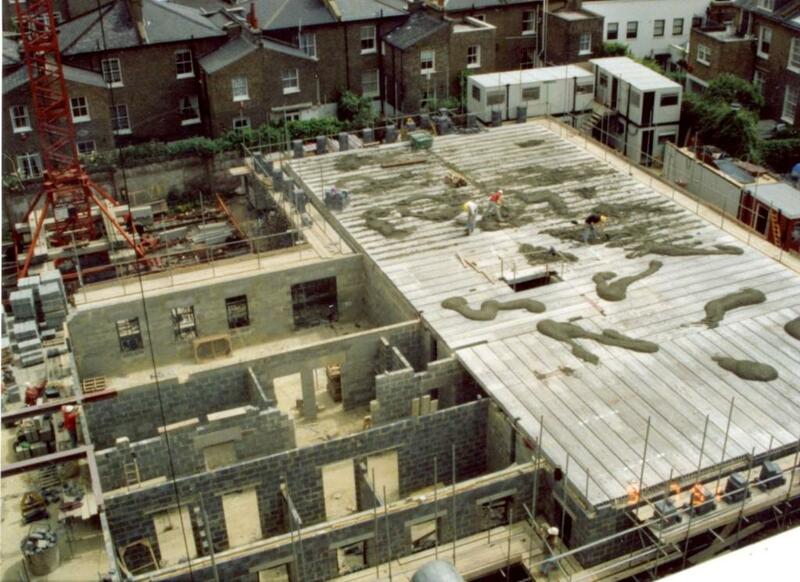 A view looking down at Netherton Grove. Blobs of cement scattered around like they were flicked from a giant brush. 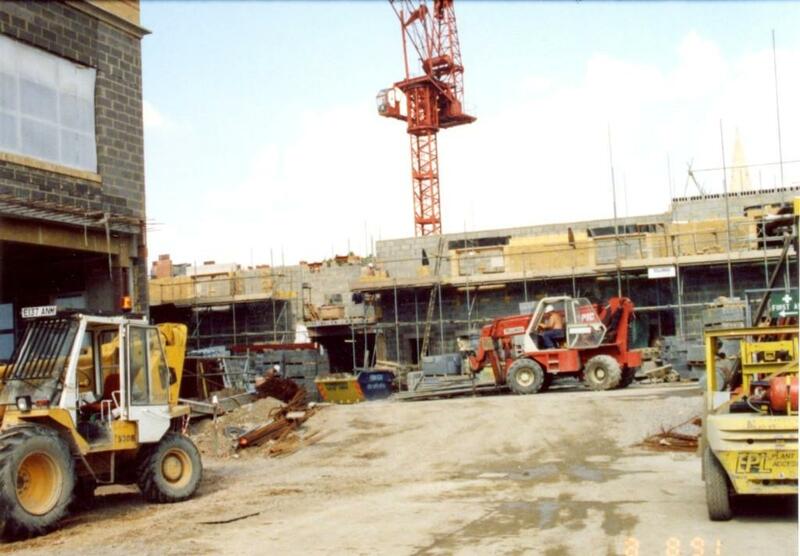 Another view of Netherton Grove showing the collection of temporary working spaces. 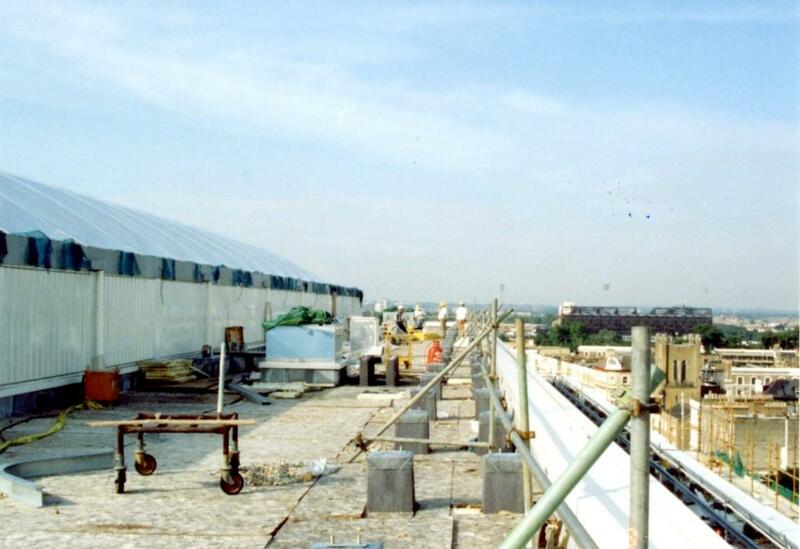 A view of the Fulham Road from the site. 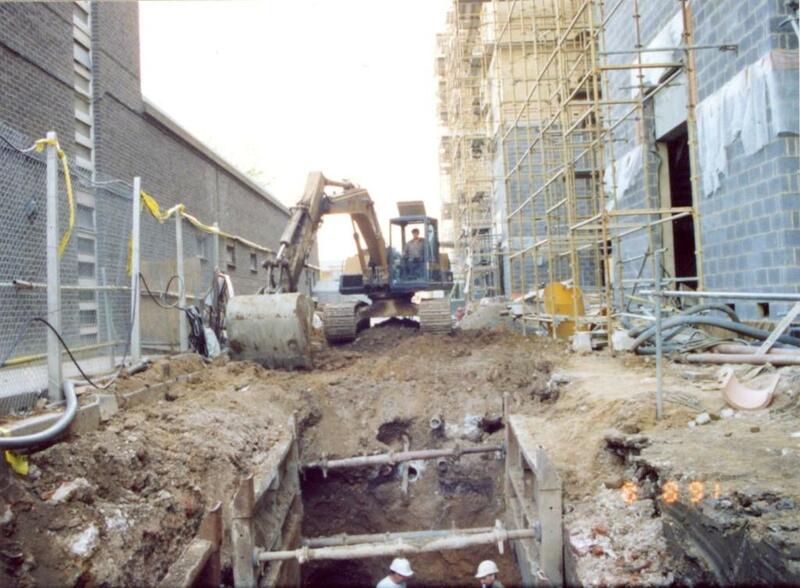 A nice big hole. 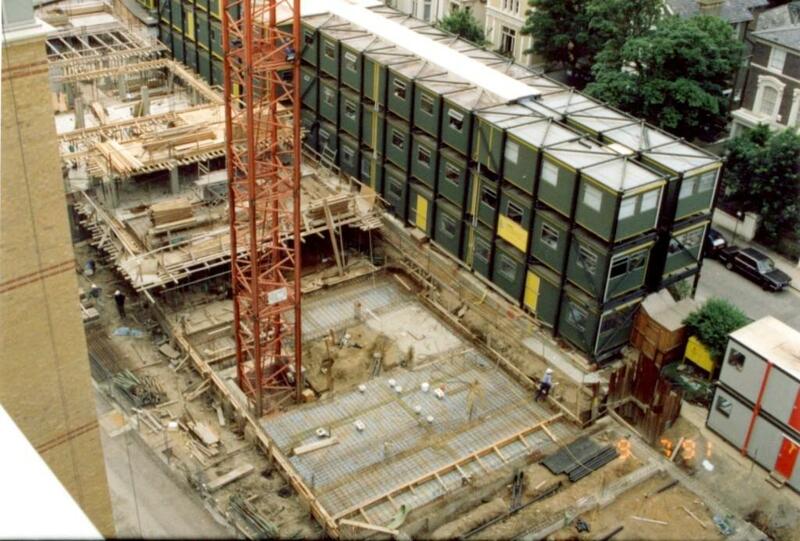 With its extensive basements and car park, the building began as a giant pit but this is just a minor hole by comparison. A gathering of small vehicles. 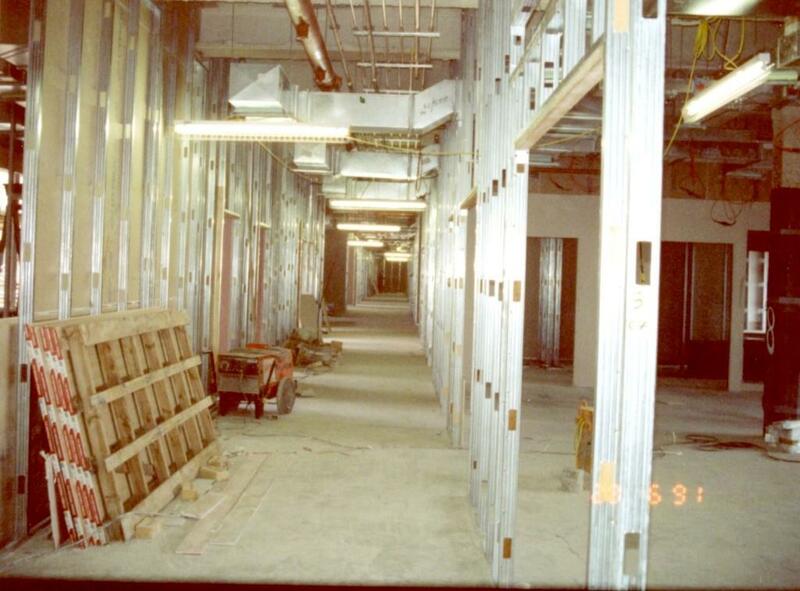 The framework of Internal spaces before walls and ceilings. 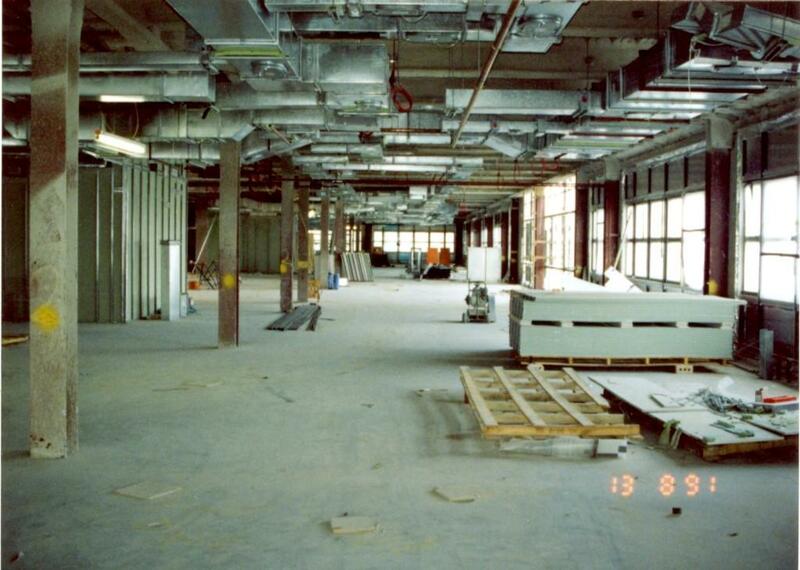 A wider internal space, possibly one of the wards taking shape. 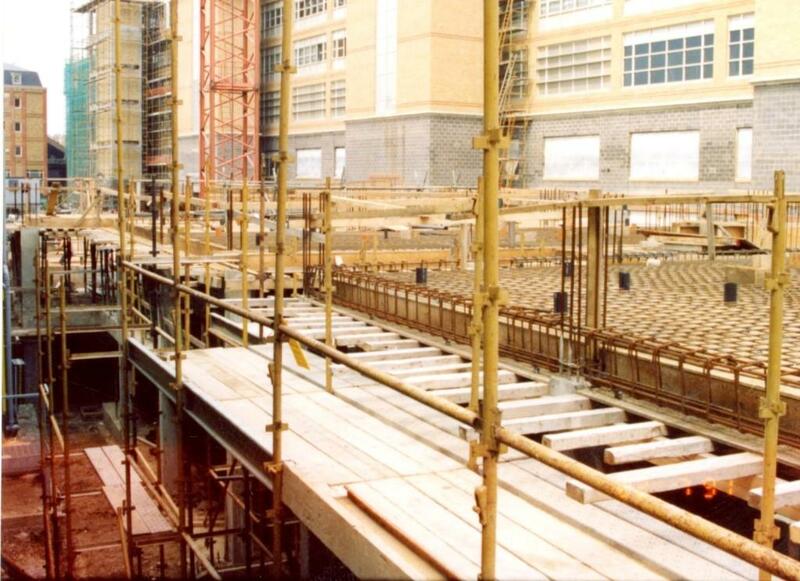 The central atrium with the skeleton of a staircase. 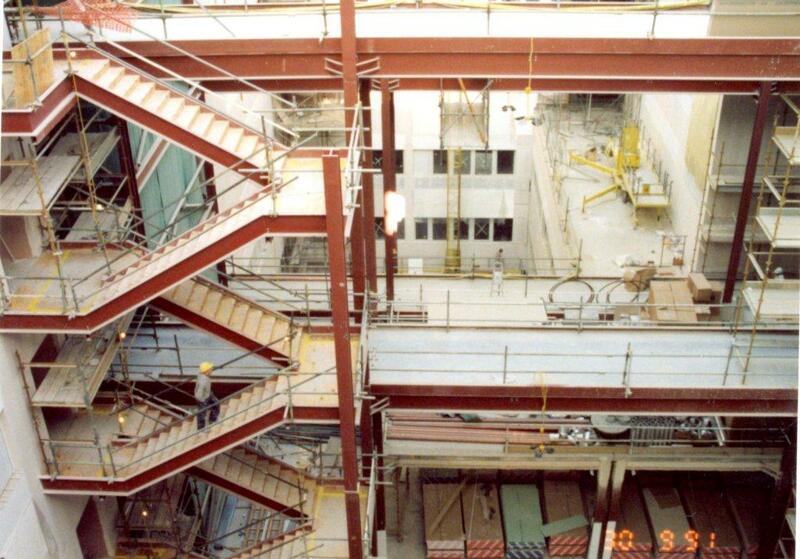 Another red steel skeleton, of one of the lift shafts. 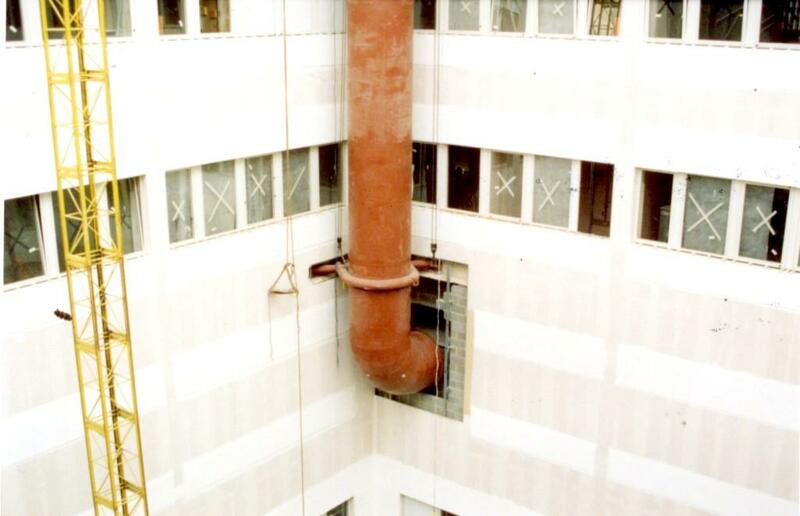 The vertiginous view down an almost finished shaft. In another light well, an enormous pipe, now clad in a pleasant colour, almost as if it was one of the many art installations in the finished space. 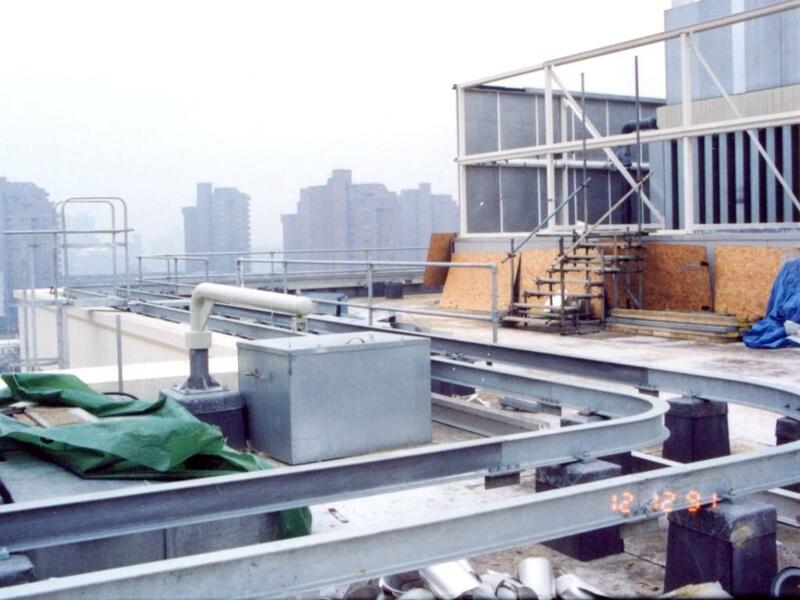 And onto the roof. Here in the distance you can see the World’s End Estate. And on a much brighter day Stamford Bridge football ground. I love these views from the calm spaces at the top of buildings. Back on ground level with some scaffolding and the usual green material behind some billboards. A quick visual credit for the Laing company who have been involved with many of London’s major building projects. As as local resident I was pleased to see our new hospital open. 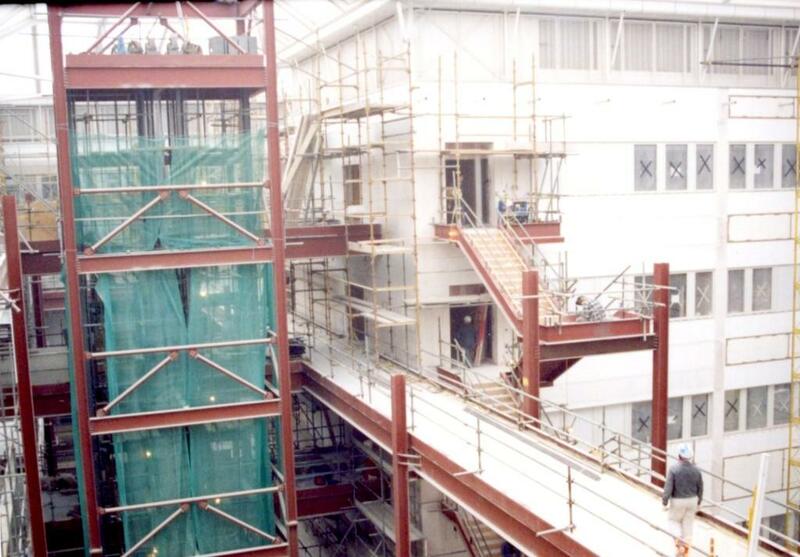 I never realised at the time how much time I would spend inside it over the years so let me thank its designers and builders and all the doctors, nurses and other staff who have worked there in the last 24 years. Special thanks to Dr Sarah Cox and Professor Mark Bower. (I could add many more names but you don’t want to see a long list) Thank also to Les Wallis without whom we would not have these photographs. I don’t want to go on and on about medical matters but just for the record I got the idea for this week’s post while lying in a cubicle in A&E at the Chelsea Westminster Hospital. A doctor was putting some pressure on a wound in my leg that had been squirting out blood about half an hour before. My mind drifted off and I went through the exercise of asking myself the quintessential local history question: what was here before? 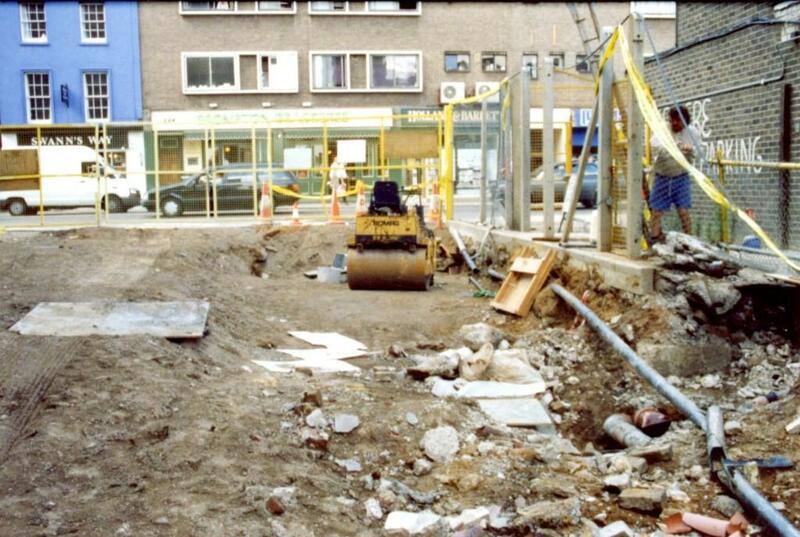 What was on this spot before the hospital, and whatever came before that? Well, the hospital is this imposing building on the Fulham Road, the dividing line between the formerly separate boroughs of Kensington and Chelsea. A long time before that the village of Little Chelsea straddled the border between the two parishes. 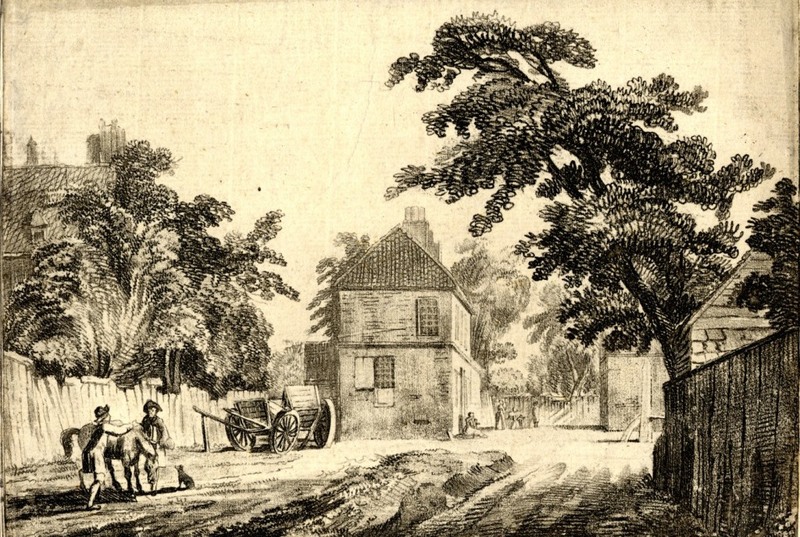 The Fulham Road, which had existed under one form or another since the 1300s was the main route between London and Fulham but as you can see from this engraving of 1780 Little Chelsea was a quiet sort of place, never more than a small collection of houses. The first major building in the vicinity was Shaftesbury House. The Earl of Shaftesbury, Anthony Ashley Cooper bought an existing property about 1700 to which he added barns, stables and outhouses not to mention “great and little gardens”. 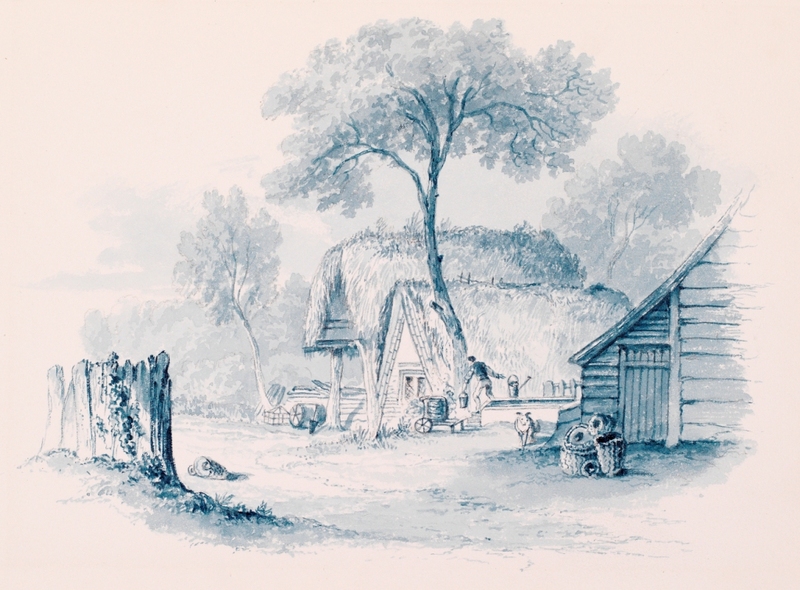 Mrs Marianne Rush depicted it in one of her enigmatic (but not always entirely accurate) watercolours. The house was demolished in 1856 to be replaced by new workhouse buildings. 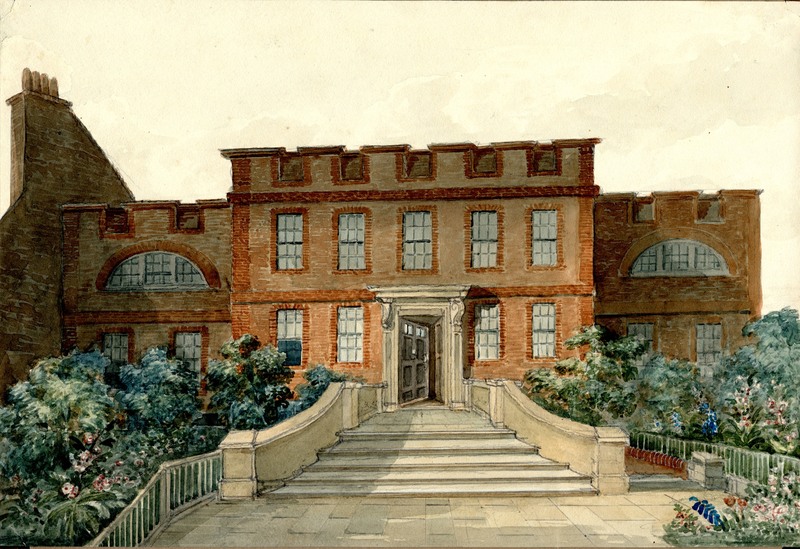 The workhouse was known as St George’s Union Workhouse, although it is sometimes misleading called the Chelsea Workhouse. The inmates all came from the parish of St George in the City of Westminster – an early example of exporting the poor. 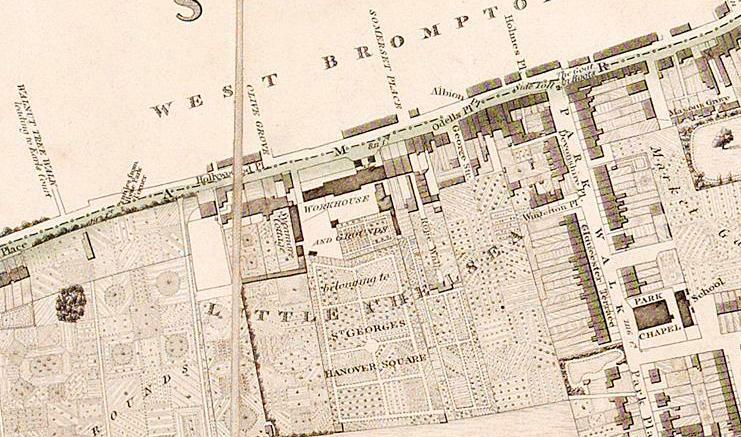 The actual Chelsea Workhouse (St Luke’s) and Infirmary was in Dovehouse Street. 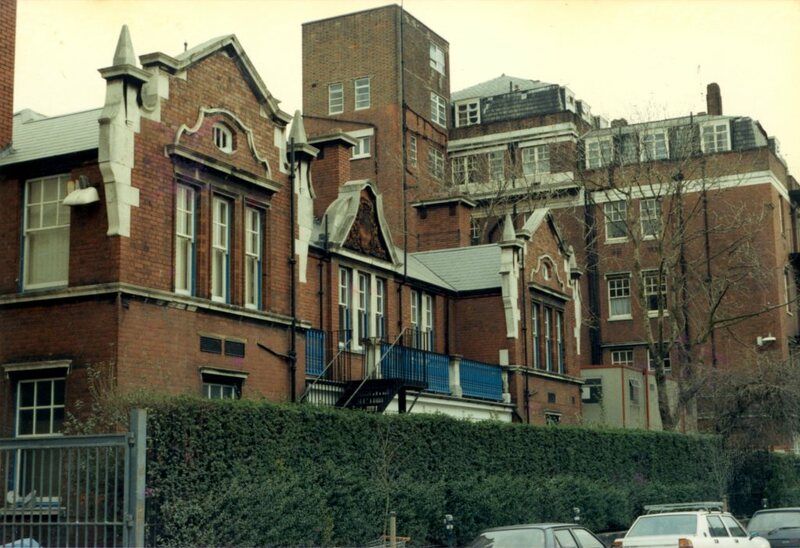 St George’s also had an infirmary opened in 1878 whose patients came from not only from the workhouse but also the Kensington Workhouse (later St Mary Abbot’s Hospital) and other institutions in Westminster. 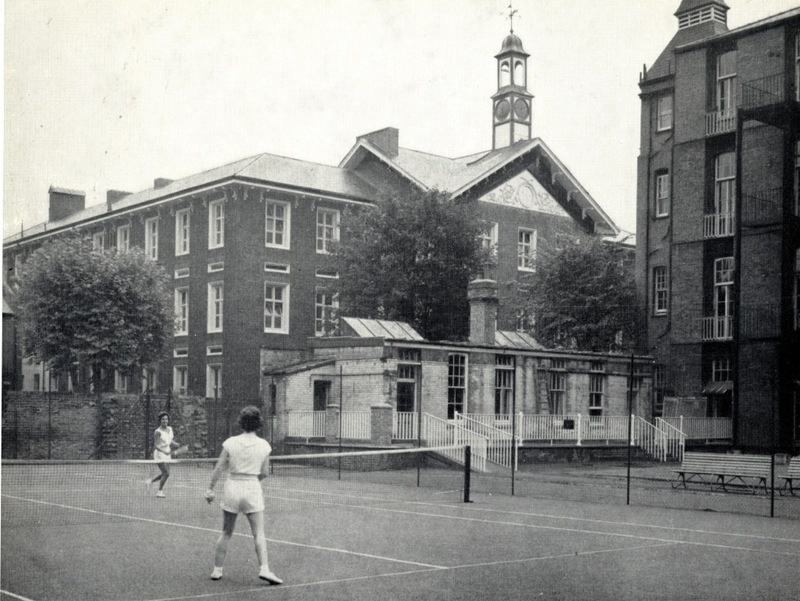 Although the number of paupers accommodated in the workhouse expanded as the institution moved into the 20th century the infirmary also grew in size and importance. 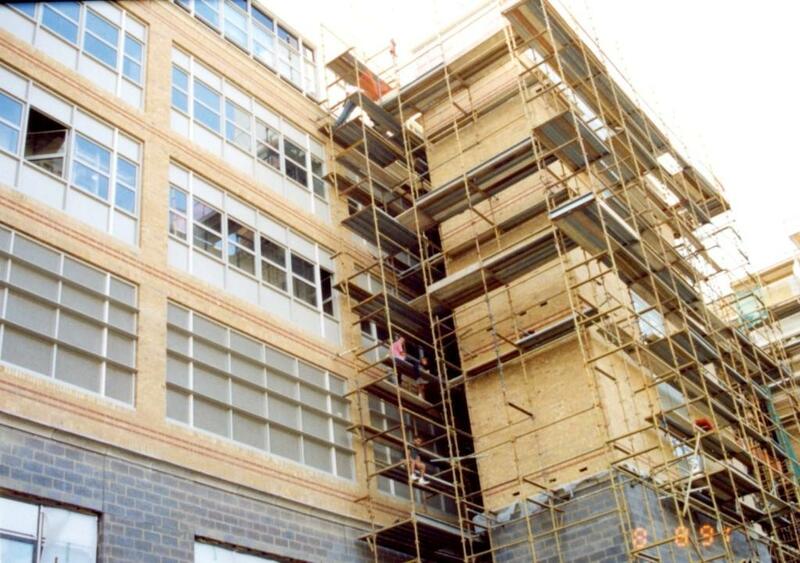 New buildings were constructed and hospital functions took over as the number of workhouse inmates diminished. This postcard shows one of the other confusing names by which the Hospital was known. 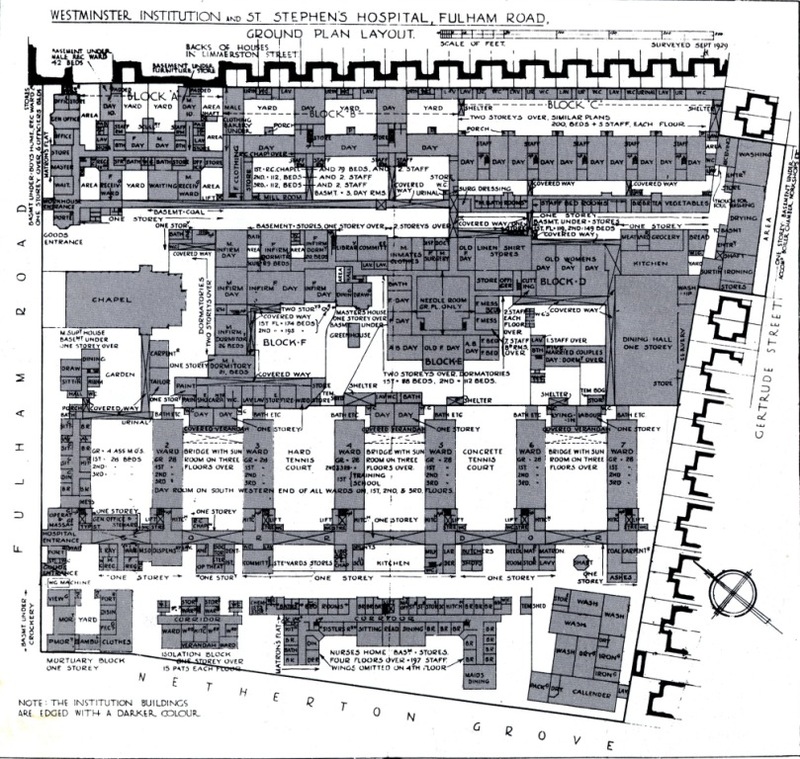 The name St Stephen’s Hospital was not adopted until 1924. The gothic tower can be seen in many views of the Fulham Road and the area around it. 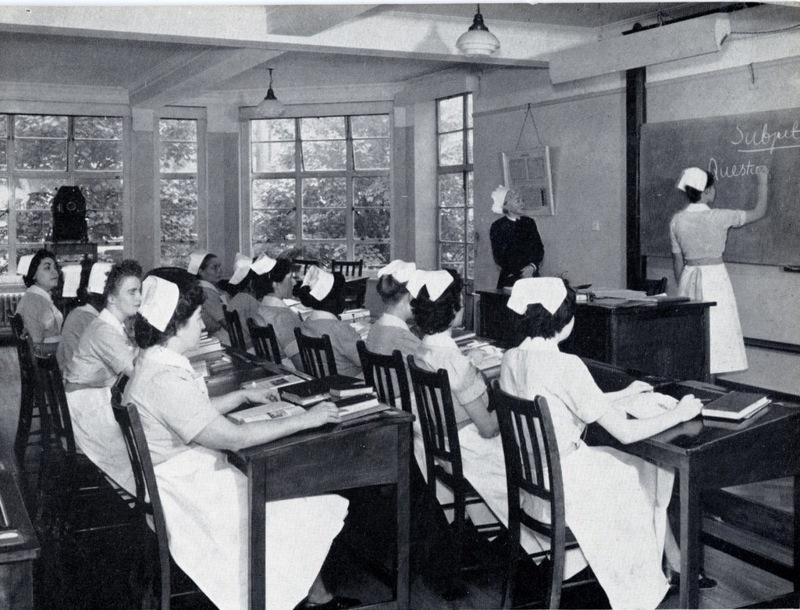 A prospectus for student nurses from the 1960s boasts of the excellent teaching and recreational facilities. 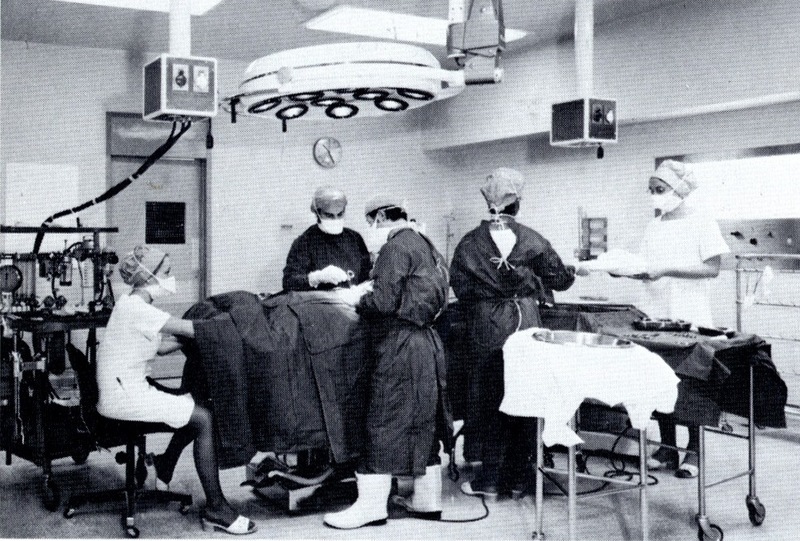 Plans were made in the 1980s for a new hospital which would combine the facilities of four other hospitals: Westminster (from my personal recollection a rather grim and grubby place), Westminster Children’s, West London (a maternity hospital), Hammersmith and St Mary Abbot’s. 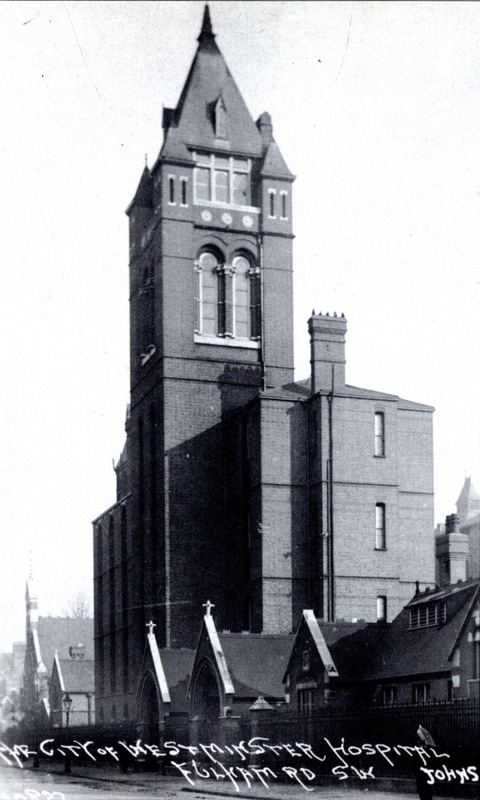 St Stephen’s closed in 1989. 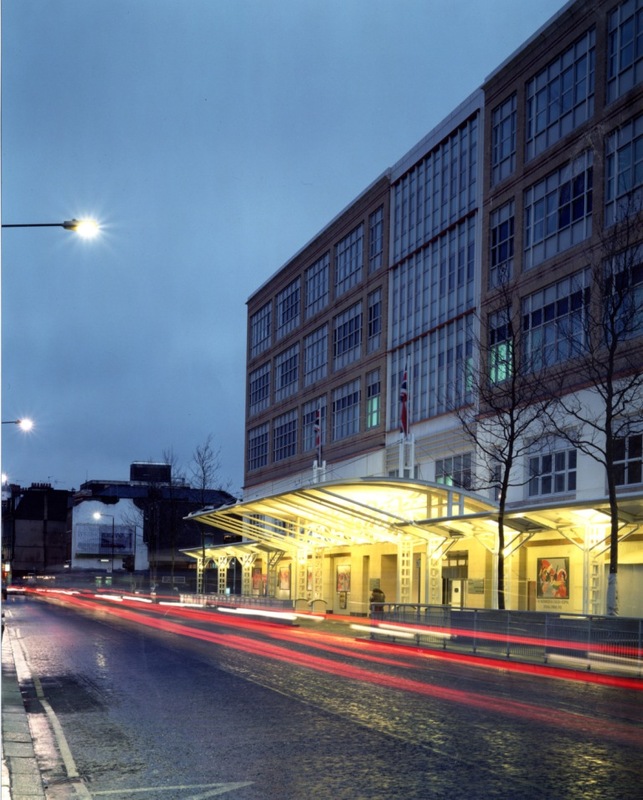 There was one occasion after the closure when I had to go with my son (now a consultant to the blog on transport matters) to Charing Cross Hospital A&E, so I for one was pretty pleased when the new Chelsea Westminster Hospital opened in 1993. The Chelsea Westminster has takeaways, a Starbucks (from which another Starbucks used to be visible in an instance of retail overkill) and a post office next to its entrance. Inside is a huge atrium with some nice examples of public art, including the Acrobat by Allen Jones, one of the largest indoor sculptures in the world, and some large slightly dusty hanging fish which I’ve always been fond of, best seen from the third or fourth floor walkways. For various reasons I’ve spent many hours in this building and although no-one really enjoys being in a hospital I’ve always felt safe and comfortable there as a visitor or occasionally as a patient, which is a good quality in a place of life and death. Many famous people have come and gone there and it’s been seen in films and on TV. But my favourite of these is the scene in Eyes Wide Shut where it doubles as a New York hospital. Tom Cruise just visible there through the main entrance. The late Stanley Kubrick was always meticulous in his choice of locations so he must have seen something striking about the place. 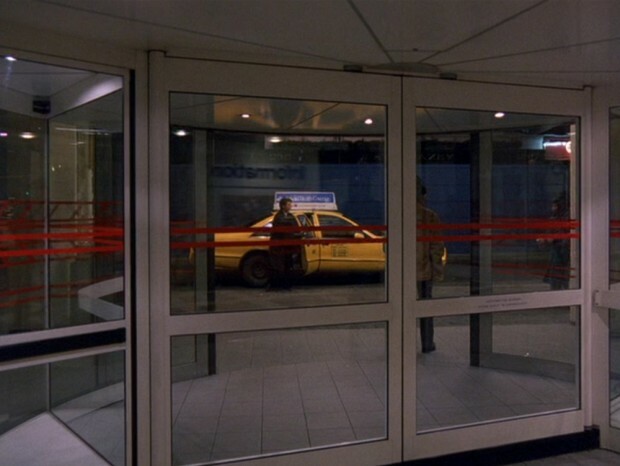 I remember being amazed as I instantly recognized the revolving doors and the reception desk. Has anyone got any other examples? 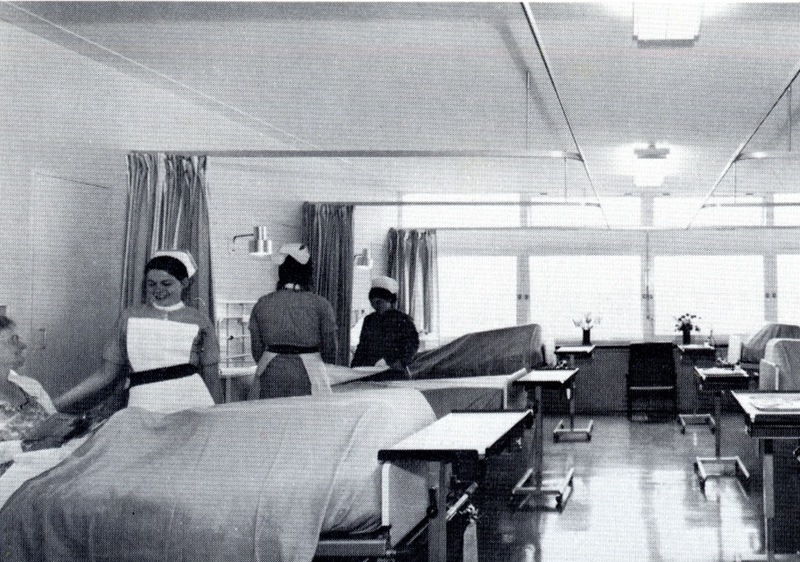 Credit should go to Chris Howgrave-Graham and Laurence Martin who wrote the excellent book The Hospital in Little Chelsea to mark the centenary of the hospital in 1978. Some of the pictures in this post come from the book. I promise not to talk about any of my medical complaints for a while. But I would like to say thank you to all the staff at the Hospital who have treated myself and members of my family over the years we’ve lived nearby.